Somebody has turned up the conference room thermostat, again. And a co-worker wears a blanket at her desk. Sound familiar? It is more than annoying. In a recent survey of more than 1,000 office workers, 46 percent reported that their office was too hot or too cold. In fact, building occupants affect up to 30 percent of its energy usage. The building sector in the U.S. accounts for about 40 percent of primary energy usage, 71 percent of electricity usage and 38 percent of carbon dioxide emissions. 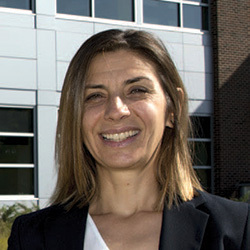 Panagiota Karava, the Jack and Kay Hockema Associate Professor in Civil Engineering, wants to help change that. Somebody has turned up the conference room thermostat, again. And a co-worker wears a blanket at her desk. It is more than annoying. In a recent survey of more than 1,000 office workers, 46 percent reported that their office was too hot or too cold. In fact, building occupants affect up to 30 percent of its energy usage. The building sector in the U.S. accounts for about 40 percent of primary energy usage, 71 percent of electricity usage and 38 percent of carbon dioxide emissions. Panagiota Karava, the Jack and Kay Hockema Associate Professor in Civil Engineering, wants to help change that. With a $1.2 million National Science Foundation grant and private industry support, she and an interdisciplinary team at Purdue are developing practical solutions for reducing the energy consumption and environmental impact of buildings. And, most importantly, making people more comfortable at work. Karava emphasizes the importance of having diverse researchers on the team. "We have civil engineers, experts on smart buildings and indoor environmental comfort, led by me and Thanos Tzempelikos, from Civil Engineering." Ilias Bilionis, Assistant Professor of Mechanical Engineering, is a mathematician working on predictive algorithms; Jianghai Hu from Electrical and Computer Engineering studies control theory. Also on the team is Robert Proctor, a psychologist from Psychological Sciences. The project goal is to develop an automatic system that connects the environmental control subsystems in a building with data from sensors and controllers and from human beings — and then automates the operation of the building. In laboratory and field studies, the team has been using human test subjects to map indoor-environment conditions as well as thermal and visual perception and comfort. "What we mean by thermal and visual perception is this: How do people perceive the thermal environment — is it warm or cold or neutral — and how comfortable are they with their sensation?" Karava says. Similarly, subjects report on their perception of the room's visual conditions — bright or dim or neutral — and how they like it. With this and other data, the researchers do probabilistic classification of human perceptions and satisfaction and create algorithms for building systems to "learn" individual and group preferences. Results of the studies are being integrated into a cyber-enabled solution for self-tuning devices such as thermostats and actuators for lighting and shading. The team will quantify the resulting reduction in energy usage and the improvement in human satisfaction, which will help enable automated, personalized control systems. "We get data from sensors, we account for the way different devices are controlled and their state of control, and then we get feedback from the occupant. From there you develop a probabilistic model that can predict what conditions different occupants prefer," Karava says. 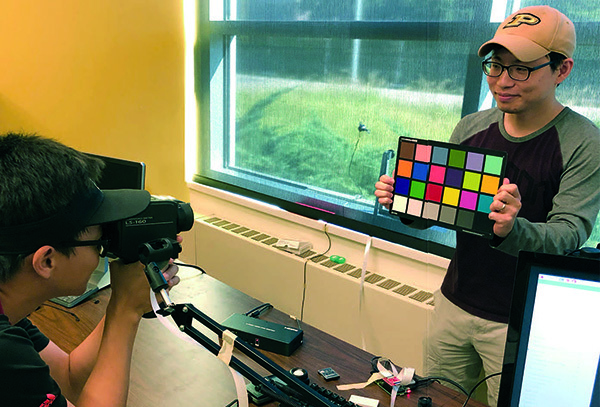 From left, Civil Engineering PhD students Joe Xiong and Seungjae Lee measure luminance levels at Herrick Laboratories. The data collected is then utilized to develop new algorithms for self-tuned indoor environments. Naturally, the building industry is highly interested in the work, which is taking place in Purdue's Center for High Performance Buildings, based in Herrick Laboratories. "It is a building to do research on buildings," Karava says. The center has multiple industry partners that are helping to fund this research, including corporate giants such as Honeywell International Inc. and JLL Inc. The project is unique in that it is funded by the federal government as well as private industry, which speaks to the eagerness of the public and private sector to rein in energy waste and improve occupant satisfaction. "It is really beneficial to have research that is funded by NSF and industry for three consecutive years," Karava says. The project is in its fourth year, and Karava is excited to be able to share the results of the team's efforts: "We have conducted really transformative research by collecting data from humans and their preferences, analyzing the data, and then developing technological solutions toward optimal control of the indoor environment. This year we're planning to work with an industry partner to demonstrate our concept outside the Purdue campus."